Many of the world's leading climate scientists didn't see the drop coming, in large part because it happened as a result of market forces rather than direct government action against carbon dioxide, a greenhouse gas that traps heat in the atmosphere. Michael Mann, director of the Earth System Science Center at Penn State University, said the shift away from coal is reason for "cautious optimism" about potential ways to deal with climate change. He said it demonstrates that "ultimately people follow their wallets" on global warming. "There's a very clear lesson here. What it shows is that if you make a cleaner energy source cheaper, you will displace dirtier sources," said Roger Pielke Jr., a climate expert at the University of Colorado. In a little-noticed technical report, the U.S. Energy Information Agency, a part of the Energy Department, said this month that energy related U.S. CO2 emissions for the first four months of this year fell to about 1992 levels (see chart above). Energy emissions make up about 98 percent of the total. The Associated Press contacted environmental experts, scientists and utility companies and learned that virtually everyone believes the shift could have major long-term implications for U.S. energy policy. While conservation efforts, the lagging economy and greater use of renewable energy are factors in the CO2 decline, the drop-off is due mainly to low-priced natural gas, the agency said. The International Energy Agency said the U.S. has cut carbon dioxide emissions more than any other country over the last six years. 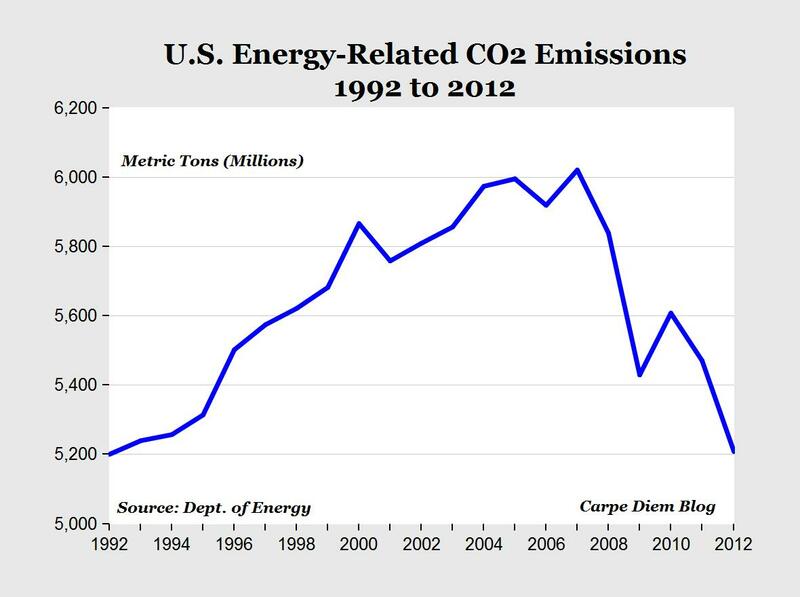 Total U.S. carbon emissions from energy consumption peaked at about 6 billion metric tons in 2007. Projections for this year are around 5.2 billion, and the 1990 figure was about 5 billion. MP: Unlike renewable energies like solar and wind that reduce carbon emissions but are uneconomical even with billions of dollars of taxpayer dollars, the shale gas revolution has made a significant contribution to reducing CO2 emissions to a 20-year low without any taxpayer support and it wasn't even part of any intentional energy policy from Washington, or any regulatory directive from the EPA. As the article points out, it was market forces and private sector activity, not government policies, that brought CO2 emissions down to 1992 levels. Another great example of how society is "cleaned by capitalism." Welcome to the shale gas revolution. The interesting question is, "how much is left?" I'm not referring to high-sulphur stuff, buried two miles beneath a mountain in Alaska; I'm thinking of resources that will be "practical" to extract. I think you mean, thanks to a collapse in the real economy US emissions of CO2 drop to 20-year low. "I think you mean, thanks to a collapse in the real economy US emissions of CO2 drop to 20-year low." No collapse in the compounding extension of a personal silly season. The silly season of VangelV. Collapse in the real economy? Nice try. Real GDP is an all-time record high, and is 3% above 2007 level, while CO2 emissions have fallen by 13.5% over that period. So the significant drop over the alst 5 years is all about the game-changing shale revolution, and has nothing to do with a collapse in the real economy. So the esteemed Prof. is saying that cheaper energy will displace more expensive energy. Thanks I didn't realize that. But I think his point was that the lesson is that they should make the "cleaner" energy cheaper than the "dirtier" energy so this displacement happens. So sudsidize the cleaner and tax the dirtier to achieve the policy goals. Somehow I think Prof. Pielke Jr. misses Dr. Perry's point that nat. gas did this "without any taxpayer support and it wasn't even part of any intentional energy policy from Washington, or any regulatory directive from the EPA." Total emissions peaked in 2007. Through 2011 petroleum declined by 304 units (11.7%) and coal/gas declined by 244 units (7.2%). There is something more profound happening than the shale gas revolution. The chart here is focusing only on energy-related CO2 emissions. Are you discussing overall emissions? May be a mismatch here. Good news, but no reason to let up on the other fronts. I live in New England, and, no, there is no natural gas line in front of my home. Thus, I must heat the house and heat hot water with oil. I put in an expensive, high-quality solar collector, whose loop preheats my hot water (unless it is buried in snow, it keeps working); the working fluid up to the roof is propylene glycol. It cost $9000 to install -- a handyman I am not -- but the most conservative estimate is that I am getting a 5% rate of return on investment [at least 150 gallons of oil a year at $3 or so a gallon]. That appears economical to me. "Good news, but no reason to let up on the other fronts." No, of course not. Just because fewer government resources are needed to cripple US energy production under the pretense of controlling Earth's temperature, is no reason not to put those resources to work crippling something else. Probably nothing too profound going on here. Electricity production is down about 1.9% from this time last year. The decline in ngas emissions is likely due to this as ngas is taking more share of electricity generation. Were it the case that methane produced ten times as much CO2 per unit of energy as oil or coal, market forces would happily select for that, too. The market favors the cheapest source of energy, as reflected by the price. The cost of the waste produced in the production and combustion of fossil fuels is not reflected in the price, and this is by definition a market failure. We are lucky that methane is cleaner than oil and coal, but it's just that -- luck. A second point: "... it happened as a result of market forces rather than direct government action against carbon dioxide." You mean government actions like cap-and-trade or (better) a carbon tax, both of which incorporate external costs into the price of fossil fuels? Yes, those have been entirely ineffective, but this might have something to do with the fact that Congress has refused to enact them. Renewables are, also, starting to play a part. We now have 50,000 Megawatts of Wind in place, and Solar is starting to ramp up. I think I read that 34% of new power plant construction in 2012 is "Renewable." Also, we've replaced almost 10% of our gasoline with ethanol, and the fuel efficiency of the fleet, overall, is starting to climb. "It cost $9000 to install -- a handyman I am not -- but the most conservative estimate is that I am getting a 5% rate of return on investment [at least 150 gallons of oil a year at $3 or so a gallon]. That appears economical to me." That means it will take 20 years to recoup your initial costs, at which time you will then start saving money on oil. That assumes no maintenance or repairs in 20 years, and that the system has a long useful life after that. I take it propane isn't available in your area. "I think I read that 34% of new power plant construction in 2012 is "Renewable."" Big deal. What percentage of total US energy use does that represent? Thermal solar as described here for pre heating hot water is easily cost effective. Solar pv is stir expensive but getting cheaper every year. How long will progress proceed before you clowns eventually see a competitive business opportunity? Sure, we might discover a tritium mine tomorrow, in which case all brats are off. I couldn't figure it out either. I would have spent $1000 all-in on an electric hot water heater and the next $8000 on weatherproofing the house and then replacing inefficient electric appliances with any leftovers. But a solar subsidy would change the arithmetic. Texas has right at 10K MWs of wind capacity supposedly available this summer. The problem is that the wind doesn't generally blow when the electricity usage is high. I know for a fact that this summer there has been numerous instances of less than 300 mw of wind generation being pushed to the grid. Thats less than 300 mw's actually on line and being pushed to the grid out of the 10,000 mw's that the greenies love to brag about. That's why San Antonio is building 400 MegaWatts of Solar. Wind at morning, evening, and night; Solar during the day. Neither solar or wind reduce carbon emissions at all, they just redirect it to another place and time exactly as electric cars do. Both solar and wind require large amounts of steel, copper, aluminum, silica, gold, rare earth magnets, high tech coatings, etc. All those products and the carbon emissions from them are out of sight of the final user but are included in the price tag. Neither wind nor solar can possibly ever produce enough electricity to off set their original cost. I know you'll disagree so please post a link to date showing any wind or solar installation producing enough power to pay for itself. While it is good news about the CO2 drop, real GDP is very far from all time record highs as I just proved, as long as one doesn't ignore the various factors that I just enumerated about real purchasing power. Excluding hydroelectric, 6.22% per the most recent EIA data. "Thermal solar as described here for pre heating hot water is easily cost effective. Solar pv is stir expensive but getting cheaper every year." How about an example including numbers. the system George Phillies described could hardly be called cost effective. "How long will progress proceed before you clowns eventually see a competitive business opportunity?" When I see private businesses and private investors generating electricity that is cheaper than conventional power sources and provides a better return on total investment without subsidies and mandates or caps on CO2 I will become interested. "Sure, we might discover a tritium mine tomorrow, in which case all brats are off." Those brats will be off looking for jobs as tritium miners. It's also possible that a vast herd of unicorns will be discovered in the wilds of Northern Canada, but I'm not investing in unicorn feed manufacturers until then. "But a solar subsidy would change the arithmetic." Absolutely. That's why whenever a discussion of that nature arises I instinctively reach for my wallet to protect it. Realists who look at the fullest and most accurate picture will generally be the most correct. But they will be lonely and not very popular. People like to hear what they want to hear and would rather listen to a misguided fool than to someone who can see the truth. It is only after a crisis that they cry about being lied to and blame the charlatans who fed them what they wanted to hear for their own inadequacies. Yes, things are moving right along in California. Doesn't that ring a few alarm bells? If you have electricity demand dropping by 1.9% even though you have a very hot summer in the northeast and south real economic activity has to be declining by much more than even the skeptics are suggesting. It also appears that my original post from which you quoted has been deleted. I'll try again for the last time, and without the chart link in my next post. How? The evidence is clear that the central banks and governments have been manipulating LIBOR, short term interest rates, longer term rates, real estate markets, bond markets, and even the stock markets. If that is the case TA cannot be useful to anyone who applies it as it is intended. I would actually argue that it is useful to the manipulators as they force certain resistance and support levels to be breached and force the TA people to acquire or dump positions. While manipulation/control is very much alive and well and easily provable, "chart painting" has also been around for decades to fool the unwary. It's also described by phrases like "bull trap" or "bear trap". My basic point is that TA can still be very useful when one takes chart painting and manipulation/control factors into account. TA alone can be workable, but it works much better in conjunction with sentiment, fundamentals and a "discount" for and awareness of manipulation/control factors.